When I saw the post on Is My Blog Burning about the Sugar High Friday cookie swap, I was…well…giddy. I loved the thought of being able to make two of my favorite cookie recipes before Christmas and for no good reason, save for taking their photos and eating them! When I was little, baking cookies during the holidays was something I so looked forward to doing with my mom. In these parts (umm..that would be my parents zip code), my mom’s cooking is the stuff of legend – and her cookies were no exception. Scoring a tin of them at the holidays made those people who just didn’t make the cut green with envy. There were the same treats every year: lemon bars, raspberry thumbprint cookies, old faithful chocolate chip. However, the one cookie that made everyone swoon was The Snowball. They were always at the bottom of the tin so as not to get their powdered sugar all over the other cookies…so they always got eaten last. When people bit into them, not expecting the chocolate in the middle, they grinned a crumby, sugar covered grin. Beat butter, sugar and vanilla until light and fluffy. Add sifted flour and nuts, blend well. Chill dough about 1/2 hour. Remove foil from kisses and shape dough around kisses, using scant tablespoon of dough for each. Roll to form a ball. While still warm roll in powdered sugar. Cool and store in a tightly covered container. Roll in sugar again before serving if desired. While my first recipe is a trip in the way back machine for me, the second one is a recipe that I just recently started making and simply adore: Five Spice Shortbread Cookies. As a general rule, I like sweets that aren’t too sweet. I prefer simple, pure flavors over desserts covered in bells and whistles (previous cookie recipe excluded, of course :) These cookies remind me of a dressed up version of Girl Scout Shortbread Cookies, which I always preferred to the ThinMint. Thank you to Ming Tsai for the recipe. 1. In the bowl of a mixer, combine the butter, sugar, and salt and cream on medium speed until blended, about 2 minutes. One by one, add the egg yolks, mixing until incorporated. Add the vanilla extract and the scrapings of the vanilla bean. Scrape down the bowl. 2. Cut the chilled log into twenty 12-inch rounds. Dip one cut surface of each round into the spice mixture and arrange the rounds 2 inches apart on all sides on a parchment-lined or nonstick cookie sheet or sheets. Hi there! I made snowball cookies too, but yours are MUCH better, as they contain a chocolatey surprise inside! I love 5 spice. I was pondering trying them in a cookie. Now I feel a bit braver and I will try this recipe! Golly! I’m not sure which of your entries I’m going to try first! They both look delicious and very, very pretty! Definetely try them :) I really love having them with some flavorful tea or coffee. They are buttery and delightful and not heavy at all! Thank you for stopping by to see my blog :) I appreciate the positive feedback! I like your recipe very much – anything with pine nuts in it is a winner in my book! 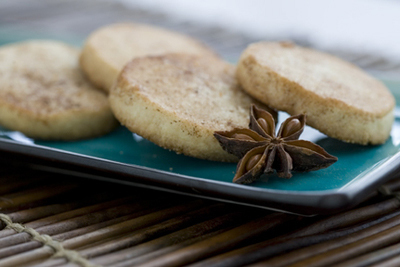 I *love* the idea of five spice cookies! 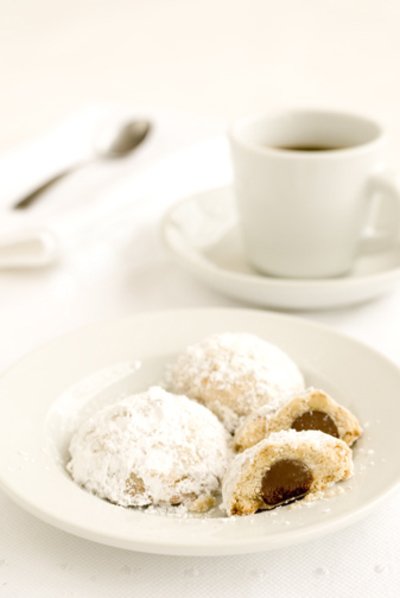 Must confess –I’ve tried a version of Snowball Cookies before and I’m scared to death of them: last time, I accidentally inhaled the powdered sugar and spent a good ten minutes choking and gasping and coughing. Maybe I’ll try again. :-) Great post! hi, did you use granulated sugar or castor sugar?